Ultra-tough polymer with steel lining, ensuring smooth feed. With small holes to see round count. Measures 1 3/8 x 7/8 x 8 5/8"l.
Glock 17, 9mm Magazine, 33 Rounds is rated 5.0 out of 5 by 21. Rated 5 out of 5 by Steve B from Glock 33 round mags these mags are 100% reliable just like everything made by glock. Rated 5 out of 5 by Ritt from Buy the original I purchased a Korean knockoff and was disappointed when it arrived cracked and inoperable. This ORIGINAL GLOCK mag works flawlessly. I should have known better. Rated 5 out of 5 by Byrddog from Great Service / Price SG does a lot for folks with great service. Product received in great shape. Can't wait for the weather to break. Ready for the range. Rated 5 out of 5 by Bubbamullet from best price built right; like all Glock products. Work well in my Ar-9 pistol and drop free.SG has the best price on these. Rated 5 out of 5 by Doc S from Great mags They work perfectly in my Kriss Vector Gen 2. Have 2 33 rd and 4 17 rnd mags. Already ran 750 through the gun. No mag problems. I recommend a loader. 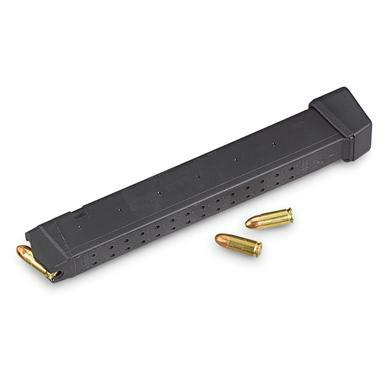 Rated 5 out of 5 by B S A from good product these work great in my jr carbine 9mm. i have ordered more. Rated 5 out of 5 by B S A from fun fun fun i got this to run in my jr carbine 9mm. i usually use glock 17 round mags. wow is this fun. i will be ordering more. Rated 5 out of 5 by James from Glock 33 rd mag. Firepower from Sportsmansguide. High quality factory magazine. Superb construction and functionality. You cant go wrong with Glock oem from Sportsmansguide.